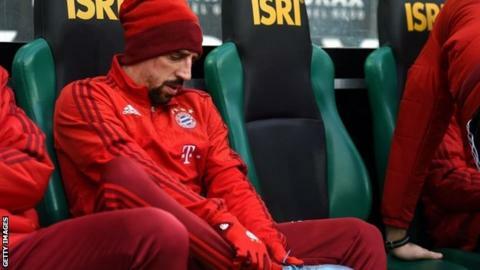 Bayern Munich winger Franck Ribery has suffered another injury, having just returned from nine months out with an ankle problem. The 32-year-old Frenchman scored on his comeback as a late substitute against Borussia Monchengladbach on Saturday, but only lasted 45 minutes against Dinamo Zagreb on Wednesday. He strained a muscle and will miss all three games before the winter break. Defender Medhi Benatia picked up a similar injury in Zagreb. "We have lost two important players," said boss Pep Guardiola.